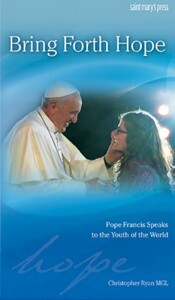 Saint Mary’s Press has published a new book based on the words Pope Francis used to address youth at World Youth Day 2013. Bring Forth Hope: Pope Francis Speaks to the Youth of the World contains 52 weekly reflections, one per each week of the year. Written by Father Chris Ryan, MGL, of Australia, each weekly reflection includes a quote from Pope Francis, a prompt encouraging readers to think about the reflection, a suggestion to take action, and a prayer. Pope Francis, like Blessed John Paul II, believes deeply in the power of the youth of the world to bring forth a renewal of the Church and society. This book is recommended for teens ages 12 – 18.